Seven schools participated in a series of workshops involving astronomy, creative writing, and art led by writer Linda Cracknell, artist Gill Russell and book artist Rachel Hazel. A 'new' constellation, was created for the Highland Year of Culture 2007. Seven stars were chosen, one star for each school and these were linked together to form the new constellation. The stars were chosen from a selection of bright ‘circumpolar stars ‘: these stars are in a part of the sky surrounding the North Star so they are visible all year round from Northern Scotland. Once each school had their star, a competition workshop was launched to create the new Highland Constellation and name it. 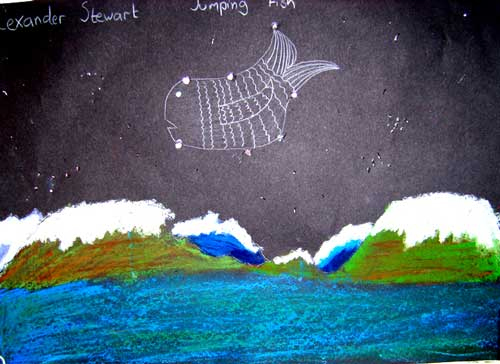 The competition was won by Ullapool pupil, Alexander Stewart with his winning design, Jumping Fish/ Iasg a’ Leum. Gill then spent several months in Glenuig, Moidart, creating three outdoor installations Sòlas, Seven Stars and Starwheel in response to the project. The artworks were opened Nov 2017 with a torchlight procession, music and entertainments and ran in-situ at Glenuig until Nov 2008. They were featured on TV programme ‘Reul-Chuirt’ July 2008. Modelled on the Highland Constellation Project (above) this project ran throughout Scotland as part of the International Year of Astronomy 2009. Gill Russell worked with eight schools across the country, astronomer and magician Professor John Brown (Astronomer Royal for Scotland) and postgraduate astronomy students from the University of Glasgow to create the new constellation . Each school was linked to an important astronomy site and they selected a star whose distance in light years corresponds to the age of the site. As well as choosing their school star they enjoyed two days of workshops with a planetarium show, magic and art workshops.